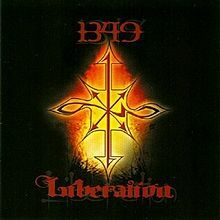 1349 deliver LIBERATION, which is full of intense black metal that mixes old-school Nordic atmosphere with modern warp-speed madness and intensity! LIBERATION is regression: bare bones, raw, chaotic, and shredding hellish darkness, rage, and insanity! 1349 features Frost of Satyricon and Gorgoroth fame!